The Gay Gamer: Happy birthday to me! I know it's a bit uncouth to wish oneself a happy birthday, but don't judge me too harshly. There's a point to this, er, self-celebratory post, after all. 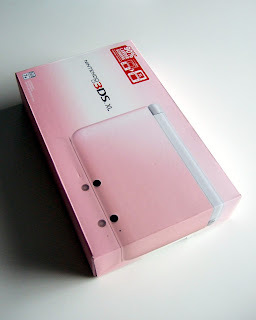 As for what that is: Well, it's to point out that I recently bought myself (using birthday money from my parents) one of those pink-and-white 3DS XLs I've been fawning over since the Japanese version was announced in late August. Don't fret too much over that yellow-ish bottom screen, by the way; in reality, it isn't noticeable (or at least it isn't to me). What do I think of it so far, you ask? Let's just say I have a feeling that, from now on, I'll only pick up my original 3DS when I want to play it while I'm out on the town. In every other situation, though, I'll be reaching for the beauty you see in the photos above. Not my personal taste in color but happy birthday! Enjoy Paper Mario Sticker Star and eat cake, but not in the French revolution kind of way. Not my personal choice in color but Happy Birthday! Enjoy paper mario and eat cake but not in that French Revolution kind of way. so wait, I know there's region lock, so you actually bought a Japanese version of Sticker Star? Oh, and I promise not to eat my cake in a French Revolution kind of way. (Love it!) Actually, I don't think there's going to be any cake -- which is OK with me! Thanks, Kaze! And, yes, it's ADORABLE. Honestly, I'm kind of afraid to use it at the moment. Well, only "kind of" ;) And don't give up on that Animal Crossing model. I think it at least has an OK chance of being released here next year. I'll cross my fingers for you! Oh, sorry, warp, I think I worded things a bit strangely in the post above. The XL I bought is a US one, but I've wanted one of these pink-and-white ones since they were first announced for Japanese release earlier this year. Does that make sense? So, my copy of Paper Mario is the US version--thankfully! BTW, I just edited the post a bit to (hopefully) make things a bit less confusing. OK, I didn't even know we had new colors here yet. I've got a red one waiting for me to open on Xmas, but I'll probably exchange it for a mario kart bundle (even tho I hate racing games). So are there just 3 colors here now? Well, don't feel too bad, warp--this color was basically 'stealth released' by Nintendo of America. So far, it's only been made available via Gilt.com (where I got mine--although it's no longer available there) and the Home Shopping Network. Supposedly it will be made more widely available soon, though. And, yes, we have just three colors here in the US at the moment, as far as I'm aware: Blue/black, red/black and pink/white. I wouldn't be surprised if the Mario-branded one and the all-black one were released here soon, though--and hopefully the all-white one, too! First and foremost, I hope the 3DS XL is merely the cherry on top of an awesome birthday sundae. Secondly, does that mean you're not going to invest in an Animal Crossing 3DS XL, should it ever make it to the US? As for your question about the Animal Crossing XL: Woof, I don't know! Honestly, I've kind of operated under the assumption that it won't be released here. But if it is? I honestly don't know what I'd do! I'm kind of hoping I'd be able to resist buying it, though. I was like you, never having seen one in the wild. I still haven't seen one...and now? You have one. Umm...this comment went awry somewhere. Anyway...Happy birthday and I hope you get many many many miles out of it! Thanks, Justin! I wish we lived near each other so that you could come over and check out my XL. (OK, so that sounded a bit dirty.) Actually, maybe you should be happy you can't do that--as I think that you'd want one after getting a chance to hold one in your hands, etc. Honestly, for me, the best thing about it is how solid it feels in your hands, although the huge, beautiful screens are nice, too! Now all that DS needs is some white decal stickers on the front. A fire flower, perhaps. Or Peach, if that's not OTT. Have a fantastic day and keep us posted if you get any other game related goodies. Haha - happy birthday, Bryan! No worries about calling it out for yourself, I did the same thing in my blog earlier this year, and simply tied it to something video game themed. Never seen one of these systems myself. As you can see on the pictures both boxes have a yellow warning-sign which sais "AC adapter is NOT included". After all I prefer my preordered yellow Pikachu-version which I will get on 7th of december with Paper Mario (eu-release). But obviously that's not possible so I have to send you my best birthday-wishes from Germany! Hey Brian, check your emails! You should find the 4 Doubutsu No Mori parts as a little birthday-surprise! (I know I promised to send those to you a long time ago...sorry for letting you wait) I hope you like the movie. Thanks, Chalgyr! And, yeah, what can you do when it comes to your own birthday, right? BTW, when you say you've never seen one of these systems before: Are you talking about the XL in general, or the pink-and-white XL in particular? Ah, I just checked! I'll give it a go tomorrow, OK? Thanks so much--and don't worry at all about taking a while to get it to me! Ha! It would be difficult to offend me, Anne--especially when it comes to age, etc. Anyway, thanks for the birthday wishes! The pink and white. I have seen a couple of XL's, though they never got terribly popular in my neck of the woods here. I actually would have liked the size I think, but I have somewhat large hands. But still, my kids never showed any interest in the XL versions, and I haven't seen them at work either. 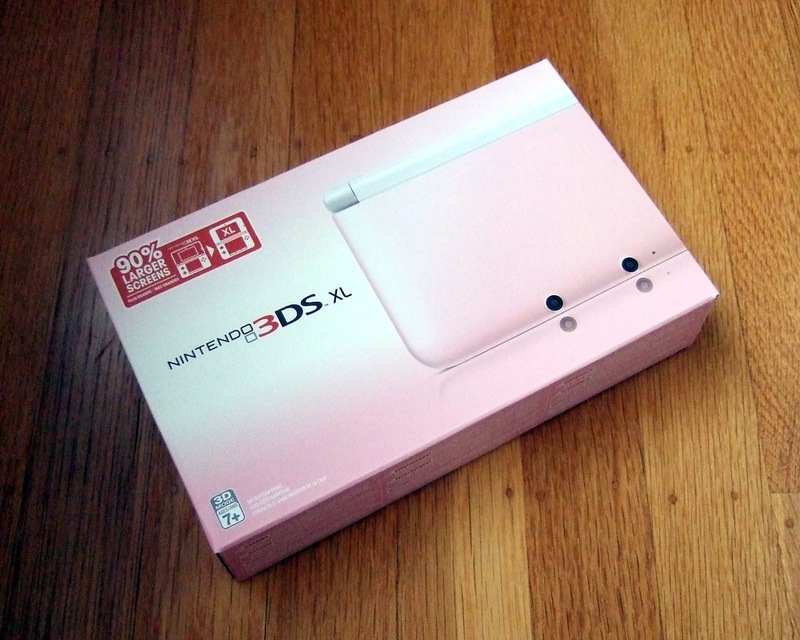 Ah, well, it's not too shocking that you haven't seen a pink-and-white XL before now, Chalgyr--they literally *just* came out in the US. Also, I think there will be plenty of time for your or your kids to get your hands on an XL should you want one, as I don't think they're going to b discontinued, etc., anytime soon! 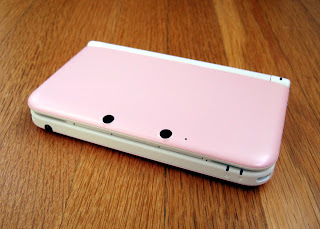 My wife fancies the AC 3DS LL, which may be crucial in finally getting the console into the house. I mean, it's almost justifiable as a, er, 'dual-purchase', right? I wrote, ever hopeful. Anyway, so you're interested in the 3DS? That's great! Although I'm currently unsure if it'll ever compete with the DS in terms of being my favorite handheld ever, that doesn't really matter, does it? Regardless, the 3DS is a pretty great little system, and a number of awesome games will be released for it next year. Which color XL are you most interested in, BTW? Do you like the pink-and-white, or do you prefer the other colors that are out there (red-black and blue-black, I think)? into gaming? Good heavens my son and I live and breath it some days. We have a collection from new to old (hence the retro gaming). We don't use too many of the older systems anymore (Dream Cast, Gamecube, Gameboy Color, GBA, Game Gear, PS2) but do like our handhelds (PSP, DS lite, iPad) and our Xbox360. I've been eyeballing the 3DS since it came out. At first there weren't too many games I was interested in and now that there's a big list...I just don't want to throw the money down for it! I'd go for the Blue-Black. Blue has always been my favorite color. That's great to hear, Jess :) I never knew you were so into gaming! Of course, I guess you may not have know that about me, either? It's great to hear you had both a PSP and a DS, by the way. I know the PSP was a bit of a failure here in the US, but I've always been a big fan of it regardless. 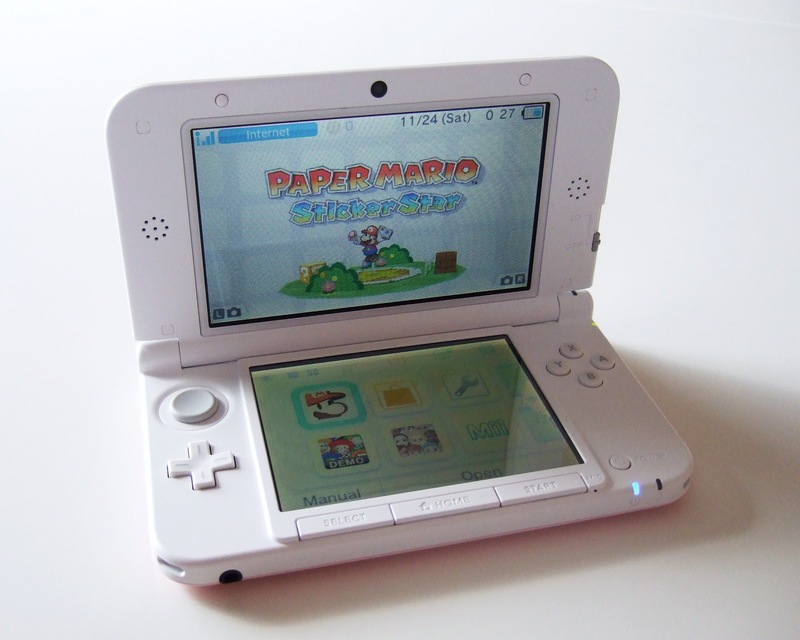 And of course I love my DS. Yea...several years ago I was an active member in GameSpot (I think you know some ex-workers from there) but it went downhill. A friend from GameSpot made his own board and I was helping out there by writing reviews and moderating the forums, but he's been so busy lately that it's starting to die. Such is internet life, I suppose. A price drop for the 3DS is what I've been keeping an eye on. It's just so hard to pick up a "new" system when you think about having to restart your game collection too so that you have something to play on it. I'm sure you know all about that! Who are the ex-GameSpot folks I may know? RE: 3DS price drop -- keep your eyes peeled because, like I said earlier, the rumblings are that the original 3DS should see a price drop VERY soon. I have a feeling Nintendo will wait a bit to drop the price of the XL, too, but I can't imagine they'll keep it at its current price for too long after the OG drops in price.